I purchased this watch used (in mint condition) in February 2003 on the gray market. It came with all boxes and papers, but with no authorized dealer stamp (so no warrantee). 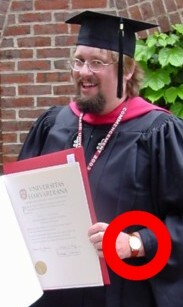 My then-upcoming graduation from a Master’s program at Harvard was, truthfully, only a rationalization for buying my first and only ‘good’ watch. I had decided almost a year before that I wanted a Blancpain, and when I first saw the Villeret in the summer of 2002, I fell in love. When one became available, it was time to gather up the requisite stack of cash. Because it was ostensibly a graduation present, I wore it only rarely between February and May. Probably three or four times a month--very likely a common regimen for this type of formal dress watch. Without a winder, the 4 day power reserve did nothing to keep it running. But to get it ready no matter how long it had rested, it was never more than 6 hours off (of course). And it took only a quick half a dozen winds to get it powered for the wrist. I wore it frequently in the summer (once or twice a week). The 4-day power reserve then became obvious, but again setting it is as simple as watches get. As a weekday watch (as of September), it has never stopped even with some 3- or 4-day weekends in there. This watch is unusual in many respects, but all of its quirkiness played exactly to my tastes. First and most obvious, it has no second hand, no indication that it is running. On a watch that is worn rarely, this might be disconcerting, but when it is worn everyday and it is always correct one quickly forgets the idea that it might be stopped. Also, I am an easily overwhelmed person (my wife, with her Harvard psych degree, says my inputs are “turned up loud”) and no seconds makes this watch ‘calmer.’ The very plain dial, the lack of extraneous printing, even the small indexes all tone this watch down and make it as easy to digest as pablum. For some that makes this watch too boring but I’m the type of person who can watch ice melt and be completely fascinated the entire time. Even after half a year of every day use, I still find myself staring at this piece and noticing small details. I’ve never seen the Frederic Piguet 1153 movement—this watch has a solid caseback (the 1153 is the designation of the cal.1151 without seconds display). Buying this from gray sources, I thought I might have to pull the back to verify what I had bought, but this proved unnecessary. First, even under high magnification, there is no evidence of any tool ever touching the pry notch of the soft gold case. Then, the combination of the 4 day power reserve and the slim case eliminated almost any other possibility for what lay within. It runs within 4 seconds per day. Conveniently, it runs fast dial up and slow crown up so this can be regulated simply by storing it in its box at night and keeping the box upright or sideways on my nightstand. I can easily keep it within a few seconds for months at a time. The 4 day power reserve is very handy for its life as a work watch. I take it off on Friday night and when I pick it up on Monday morning, the time is correct. In another few years, when I service this movement, I’ll have much more to report. This is a classic dress watch. It is a solid gold, very slim (even with the domed crystal, the total height is less than 9mm) traditional 3 piece snap together case. The snap caseback gets a lot of negative press and probably for good reason—water resistance is a minimal 30 meters and there will be damage, however slight, when removing it. The famous Blancpain stepped bezel snaps onto the case and is quite narrow to maximize the expanse of dial. It does not mate perfectly to the case because it is slightly larger in diameter than the case. This is to hide the case edges during a frontal view thus simplifying the look of the case but it means the sharp edge of the bottom of the bezel overhangs the case by about 0.2 mm and is susceptible to nicks and dings. In fact, during the year I have put a ding into this overhanging edge at the vulnerable 2 o’clock position. The domed crystal doesn’t perfectly mate to the bezel and is slightly recessed—I can slide a fingernail along the crystal and it’ll hang up where the bezel edge protrudes into the air around it. This is very slight (less than 0.1mm) but again opens up the door to damage. A century or two of polishing the bezel will no doubt eliminate these protrusions as the gold is worn away and the bezel shrinks in size. The lugs have through holes for the springbars so changing the strap is easy and doesn’t risk damage to the case from sometimes-difficult-to-handle strap tools. I have changed straps in less than a minute just to match my suit. This is such a big benefit, I wonder why it is not more popular. It does give the lugs a somewhat old fashioned look but this is clearly in keeping with the overall style of this watch. The crown is very small. This is in keeping with making the watch appear larger than it is. Since it is an automatic, the crown is not needed often, but if I wind this watch fully (50 turns), my fingers will be sore when I’m finished. However, full winding is not necessary to get it started. All this would be an issue if I didn’t wear the watch everyday since I don’t have a winder. Again, it shines as an everyday wearer. The 36mm domed sapphire crystal is coated on both inner and outer surfaces with an anti-reflective coating. This makes the face more susceptible to scratches but makes the dial even easier to read. Fingerprints cannot be wiped off, they must be washed off (I use spit). The scratches that have built up in a year are only visible when strong light reflects at a glancing angle—they are invisible during a normal viewing no matter how carefully I look. The dial is Opaline. When I fell in love with this watch, I thought it had a white enamel dial and it certainly does look like that most of the time. But in strong light, it bursts forth into tiny-scale multiple colors much like fine snow in sunlight. As I live in the snowy north country of New Hampshire, this seems appropriate. It has a stepped down hours track on which the markers are located. 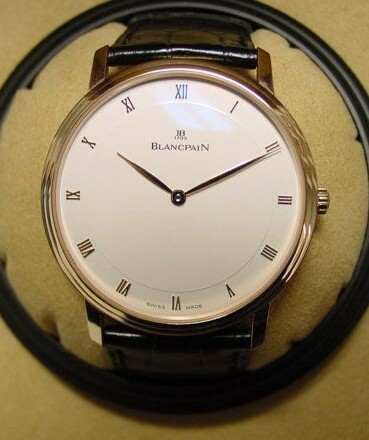 The multi-level dial is a Blancpain strength and it is done here to perfection. It adds a detail that changes with the lighting. The dial which looks so perfect on brief inspection, has several imperfections which give it more life. The first and most important is the placement of the hour indexes. There are 28 separate roman numerals, so an hour marker may be as many as 4 individual bars. These hand-set rose gold I’s V’s and X’s are flat polished. That makes them highly reflective but only at a specific angle. Since they are not exactly coplanar, at any angle only some of the markers reflect, at a slightly different angle a different set of numerals reflect. The overall effect is a “glittering” of the markers which is endlessly fascinating. Another imperfection is a very slight dimpling of the dial around the dial feet. By reflecting light from the glossy surface of the dial, I can tell that the dial feet are attached at the 2 and 33 minute marks. This is very subtle but gives anyone who has taken a dial off a watch a free glimpse into the mechanism. For example, I know I can’t convert this watch easily to right-handed use since the feet are not radially symmetric, a fact that is usually impossible to discern without surgery. The most troubling defect is a 3mm meandering scratch on the dial just under the logo. Invisible to the naked eye it is nonetheless obvious under the loupe. Since this watch has never been opened outside the factory, this was shipped with this problem. Of course, this means the dial will eventually corrode starting at this location and a repaint will be required. This doesn’t bother me. Eventually I will have to remove the hands to service the watch and this may scratch the dial. Now I’m not so worried—a small mistake and it’ll be just one more scratch, a large mistake and well, it needed some dial work anyway. There is no luminescence applied to either the hands or dial. With a multi-century lifespan in mind, luming would require endless maintenance. Perhaps when luminescent technology improves someone will paint a couple of dots onto the hands and dial. However, I do not require this from my everyday watch as I tend to work in well-lit classrooms and labs. The Villeret takes a 22mm strap which is difficult to find. Most straps that wide are made for monster sports watches and are not appropriate for this elegant dress watch. The proportions of the dial diameter to lug distance is exactly right to look traditional and normal, so I can’t argue with this design decision. The Camille Fournet thin black leather strap that came with it is first rate, but I have since gotten both a thick padded rouille leather strap for casual summer use and a medium padded blue alligator strap for winter (i.e., classroom) use. These had to be custom made in this size. I have also gotten a double deployant with rose gold ends (couldn’t afford a solid gold deployant) to minimize the risk of putting this on 5 or 6 times every week and to prolong the life of the straps. All gold Blancpains come in the famous inlaid burled wood box. It is heavy and has workmanlike joinery—it is large but not as ridiculous as some modern packaging; it fits easily on my narrow nightstand. It is also beautiful and functional. It is laquered to a multi-millimeter depth and can reflect like a mirror in the right light (notice the reflected light bulb in the picture--above right). As this makes the box slippery, the bottom of the box is felted. Inside, the top is done in padded suede. This pad presses directly on the watch when closed so there is an imprint in it and this holds the watch snugly. The plastic stage with its suede top is functional and even has silicone feet to further cushion the watch from blows to the box. The suede-clad pillow holding the watch is circular and fits into a circular hole in the stage. This shape matches the classic shape of the watch. The outer cardboard box holds both the wooden box and a boxed set of booklets: the instruction manual and the warrantee book. These are square bound with heavy coverstock embossed with an image of a typical Blancpain watch case. 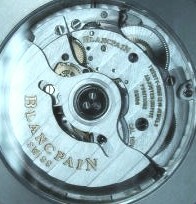 The manual tries to cover every watch in the line, but amazingly does not include this specific watch which was a late-comer to the Blancpain line. Other caliber 1151’s are mentioned so the information is available, but you’d just have to know, for example, the second crown position doesn’t exist. It is a shame there wasn’t a place made for this documentation inside the inner wooden box. With a minor redesign of the stage there would be room for it and there would be a greater chance of it staying with the watch. This is the world’s most beautiful watch. I’ve not seen another watch, at any price, that I would rather own. In February 2005, I wrote about Year Two with my Blancpain Villeret. In 2006, I wrote about Year Three with my Blancpain Villeret. In 2013, I wrote about 10 Years with my Blancpain Villeret. I have read with both admiration and enthusiasm your magnum opus on the watch I sold you this last year. I have occasionally found myself in the reveries of this truly splendid engineering marvel. I am pleased it has given you such peace and contentment. Live long, prosper and enjoy one of the fruits of Switzerland. I know having accuracy in a fine wristwatch is very important, but I feel that changing the positions and running tests to check its accuracy is almost like cheating the watch. If we wanted perfect accuracy then we should get a quartz watch. Part of the fun of owning a mechanical watch is having to interact with it. So what if it gains a minute? That is part of what the watch is. Let me know what you think. Since a watch is supposed to be the provider of information and not a consumer of information from the environment, technically it is cheating to keep it regulated by checking it against a source like time.gov. But having discovered the alternating postition strategy using this technique, I can now use that strategy to be independent of the environment and 'close enough' until Daylight Savings.